What Business Are We In? | Rabbi Lawrence A. Hoffman, Ph.D.
Synagogues should be asking, “What business are we in?” That may seem obvious, but it isn’t, and most synagogue leaders get it wrong – with disastrous consequences. The usual answers are things like Jewish education, Shabbat and holiday services, social action, or even all of the above, in the tried and true triad of religion: Torah (study) avodah (prayer) and g’milut chasadim (good deeds). Religion may be what we do, however; it is not our business. The two are not the same. The question arises compellingly in Peter Drucker’s 1954 classic, The Practice of Management. Drucker’s 1950s example is Cadillac. What it did was manufacture cars; its business, however, was not automobiles but status. Recognizing its business aright led to the realization that its competitors were not Chevrolet and Ford but high fashion and diamonds. So what is the synagogue’s business? During the years following World War II, we were in the continuity business. We had lost 6,000,000 and Israel was beleaguered. Challenged by anti-Semitism without and assimilation within, synagogues implicitly guaranteed Jewish continuity. So too did UJA and Federations, but explicitly, and when they proved better at raising huge sums of money to build up Israel and rescue Jews from the Soviet Union, they surpassed synagogues as the dominant Jewish organization. Wrongly so, synagogues complained, thinking the proper Jewish business was study, prayer and good deeds. Rightly so, said average Jews – whose passion was saving Jewish lives and who belonged to synagogues mostly to educate their children, another sign that what they wanted to invest in was continuity, not religion. What made continuity our business was the fact that the customers (the rank and file Jews) wanted it enough to “buy” it. The business is not necessarily what the entrepreneurs running the show think it is. It is what the customers want. And from the 1950s to the 1990s, the fear of Jewish discontinuity was enough to galvanize the troops. It isn’t any more, much as Jewish leaders may wish otherwise. Lots of Jews identify as Jews but not enough to insist on raising Jewish children, paying for Jewish education, supporting Jewish causes, and joining Jewish synagogues. Continuity is no longer a sufficient business to be in – not if we want to stay in business. But neither is religion – not by itself, that is. Witness the Pew study where people increasingly say they are not religious, even though they may spiritual. Still, religion deserves a closer look, not for what it is but for what it delivers. In the post War years, it succeeded as long as it delivered continuity. What does it (or can it) deliver now? Religion was once what sociologist Peter Berger famously called the Sacred Canopy — the overarching reality that drove everything people did. To abandon your religion was to trade in the very essence of who you were. Not any more, however. A moment’s observation reveals that religion has become discretionary – what we do (if we wish) with our discretionary time, money and attention. I attend Sabbath services; you play golf; she gardens. I drop $3,000 as synagogue dues; you join the country club; he buys season tickets at the Met. I go to Torah study, you attend lectures on art; others take classes in American history. But not all discretionary activity is of the same consequence to consumers. Movie-going on the odd Saturday night ranks lower than what we can call “committed pursuits,” the discretionary choices we make about matters of commitment. In the good old days when religion was a sacred canopy we knew who we were: we were Jewish or Lutheran, or Catholic or Episcopalian. Without a sacred canopy, it is not clear just what counts as our identity. And, in any event, with the religious canopy gone, we have room for multiple identities, not just our nationality: I may be an American, a Jew, a professor, and a serious violinist; you may be an American and Jew, but also a feminist, judge, and artist. Whatever we say we “are” requires the committed allocation of discretionary time, money and attention. Synagogues compete for these resources, the symbolic tokens of people’s inner identities. We are ultimately in the identity business. The Age of Continuity has become The Age of Fractured Identity. A great deal follows, most particularly, how synagogues make themselves known to the world. Synagogues in the Age of Continuity advertised programs that would keep Jews Jewish: a better religious school, a guaranteed bar/bat mitzvah, or Sunday afternoon lectures on Israel. In the Age of Fractured Identity, these still matter, but for different reasons. If identity is the issue, we need most to demonstrate that we are a serious candidate for people’s deepest selves, their aspirations to matter, their pursuit for meaning, and their desire not to have lived and died in vain. As it turns out, religion is profoundly (even uniquely) suited to this venture. That’s why synagogues matter more now than ever. My first thought after reading this was .. . We just have to figure out how to get them in the door. To a lecture , a torah study class, a meeting of young 20’s & 30’s expressing and discussing what it means for them to live a jewish life in 2015. We are all craving more meaning in our life , how can we get deeper. I don’t always want to talk about the new restaurant, I want to talk about acts of kindness that happen to me. That change my day my life and how can I be mindful of them, and stay grateful. Some days I think all we are really doing, with every action every redirection is searching for connections, deeper connections with meanins we feel in our souls. To ourselves, others , the world , to our past, and some of us to G-d. And today almost every other new product or companie is promising to help you be the best most authentic you ~ so you can find the meaningful connections we are all craving. For love , succes and to ones self. I am all about trying new things, not just once but twice. However there has never been a moment in life that I have felt more connected then when I was in Israel , studying torah with my friends , or even reading jewish articles on the M train. However I was lucky enough to get in the door. To see that synagogues were my truest playground for discovery. I am siting thinking … How can we get more people in the door , just a few steps in to see ~ what they are searching for is there for them to find, in more ways then they probably thought. What a synagogue did for me was change my life, what I think it’s business should be is making sure they make that opportunity known and open for everyone. Any way in which I can help ~ would be my honer. I very much enjoyed reading your latest posting. Re “If identity is the issue, we need most to demonstrate that we are a serious candidate for people’s deepest selves, their aspirations to matter, their pursuit for meaning, and their desire not to have lived and died in vain,” the prayer project on which we’ve been working at Emanu-El Dallas bears out that thesis. I hope I can share some of our process and results with you when I arrive in NY. Prayer is an example of what I am talking about. Public prayer is a prime symbolic way of marking identity. People take part in it without necessarily even believing in it. Especially when it comes to the intangibles of “depth, mattering and meaning,” public prayer becomes important. Worship innovation has steadily been moving in the direction of providing all three. In that regard, I am very anxious to hear more about your prayer project. And, to be sure, We are all excited about your joining us at HUC to direct the Debbie Friedman School of Sacred Music. More than it is a school of “sacred music” alone, it is rapidly becoming also a school of “sacred music and worship,” because the NY school has become a center for worship innovation, with music at its center. As always Larry, you point us to asking the right (and sometimes difficult) questions. In a world of competition for identification, helping those in our communities who are seeking meaning and a strengthening of their sense of who they are, is of paramount importance. I love the idea of using this time of year to think the latter through. In fact, if I may expand on your suggestion, wouldn’t it be nice if several rabbis used the entire sefirah period toward that end! The trek from Egypt to Sinai is the perfect period of time to have a set of ongoing discussions on identity, perhaps using passages from Pirkei Avot as texts. Many of those passages are about the issues of identity: universalism vs particularism, for example; attitudes toward peoplehood and Israel; you even have the issue of praying for the government there — launching the question of national identity as well. I loved the article, it is right on with the current culture. I do disagree with the conclusion… synagogues are not the ‘only resource’ to help on this issue. Art G.
I always learn important things from you, Larry. For many decades now. So I have a question regarding the issue of identity being the business of synagogues. 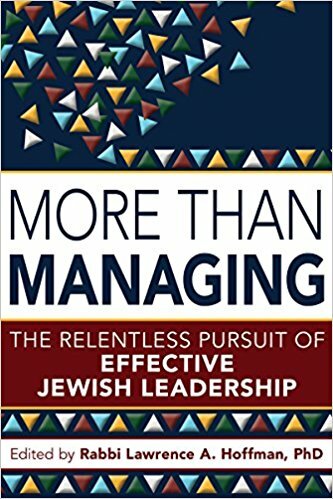 Throughout my rabbinate, I have met many people who virtually never participate in Jewish activities other than family celebrations, who say to me, “Even though I don’t belong to a synagogue, or observe Shabbat or holidays except occasionally as family gatherings, I still know that I’m a Jew, and I still try to act morally. Isn’t that really what matters most, rabbi?” These people seem to have a clear sense of, and are quite comfortable with, their Jewish identity — if not the ways in which Judaism can add depth, significance and substance to their lives. But they are also not especially interested in, or feel the need to, seek that depth, significance or substance. How do we convince them to feel that need? This is worth your reading. I don’t agree with everything Hoffman says in all cases (it would be weird if I did, being a humanistic Jew)–but in this case, I think there’s much to learn. Secularity is a complex issue. Contrary to the way we usually think, it is not necessarily the opposite of religious. In the Middle Ages when religion served as a sacred canopy, there was plenty of secular activity and thinking going on. Similarly, now — in an age of having a secular canopy — much that is religious finds a place. Moreover, we now have a third category of consequence: the spiritual. Spirituality can be found in secular pursuits as well as religious ones: listening to music, for example, or planting a garden. A good question is where the secular and the religious intertwine, at what point the spiritual that arises from the secular may also have a religious component or interpretation. Perhaps it is mostly a matter of interpretation. One party interprets experience one way; another does so in another way. Then institutions arise committed to the different interpretations. At stake is an interpretation of common experience however. This is a far cry from staking out territory, secular vs religious, as if the two cannot coincide. I really ought to change the name of my blog. To be clear, my disagreement is not with this post, and as a rabbinical student who’s done Rabbis Without Borders retreats, etc., I’m not exactly uninvested in the notion of synagogue life. I think the structural model that will work is probably something like Ahad Ha’am’s, which views the Jewish religion as a facet of Jewish culture and locates the synagogue as the true hybrid center of Jewish life. But I’m also one of those Secular Humanistic Jews who thinks that we’re more of a religious stream of Judaism than Jewish cultural club, so perhaps I’m an outlier. As a secular Jew, who is also a good friend and congregant of Rabbi Gurvis, I guess I trend more toward identifying myself more with The People than with faith. Even though I do not feel the presence of a living God. Such that the saving of a single life, saves a world. The end of a week of toil. But because they are sound and just. And I am of the we. Because I am a People, not a Faith. Thank you, Larry. As always, incisive and challenging.